I think part of the problem is that this year has been pretty full on for us really, the other half has a new job and is juggling full o six days a week work. I am working from home, that and eldst is getting that much older and of course my baby, he is now in nursery *sniff sniff..wimper* so thats three trips back and forward to school, ten min trip each way in the car SHHEEEEESHHHH. The shop also needs to be kept going, and I am, here are some new listings to wet your appetites, the yarn, Orchid is DEVINE, if youdont want it I might just run up a tree with it and not let it go!!! 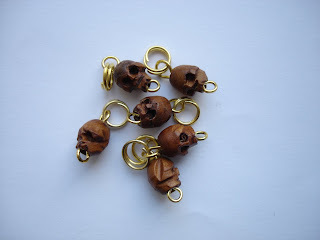 again, smaller wooden heads, aint they cool! Your yarn is gorgeous too! Dont feel like a failure, it sounds like you have a lot on! Remember everything doesnt have to be "perfect" as long as you're with the ones you love! ....now I just need to follow my own advice! 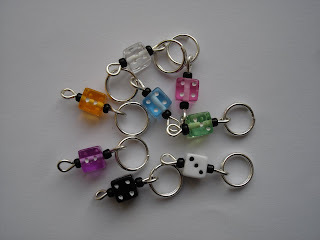 Love the new stitch markers! I'm right there with you, if it makes you feel any better. :-) Luckily I don't have too many knitted gifts that I *MUST* work on, although I had dreams of having lots done. But I still have some store-bought gifts to get, and there will be no more safe times to go to a mall from here on out...hmmph. Good luck getting it all done. 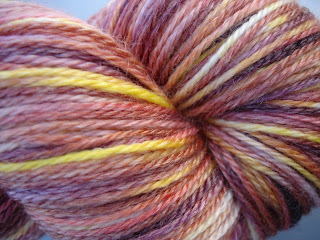 And I love the orchid yarn! Scrummy! TEN DAYS. *runs around in circles* I have three exams to do, two gifts to finish, and an entire apartment to spit-shine. In one week, because it all starts going to h*ll on the 23rd. PHEW glad you are all there with me too! !